It was a quiet morning in the park, a slight chill lingering in the breeze. The trees were filled with budding flowers due to emerge in an ocean of pink and white hues in couple of weeks. Woodsy scents hit your nose as you ventured deeper into the forested park, keeping a slow pace as you walked down a familiar path. You were humming the theme song of your favourite anime, matching your pace in time with the tune. A soft chuckle came from your companion as you skipped forward to match the song’s chorus. Turning around, your eyes met with a pair of heterochromatic ones. “I’m surprised you’re in such high spirits this early in the morning,” Todoroki commented, easily keeping up with your pace. The spring breeze was cool upon his skin. A shift in his position, he turned to lie on his back, letting out a breath of content as he felt sunlight on his lids. He remained in his position with his arms below his head, waiting. "I just knew you'd be here." Upon hearing your voice, his lips twitched up into the start of a smile. "You're interrupting my nap, [Name]." Aomine commented, opening his eyes to watch as you straightened up from climbing up the rooftop ladder to walk towards him. "Too bad. I've been looking for you." "Well, here I am," his tone was haughty and his expression matched his voice. "Did you need something from me?" "Do I need a reason to see my boyfriend?" You raised a brow in question. "Of course not." Aomine grinned. You casted a shadow upon his lazy figure when you towered over him. "Stand a little closer, would ya?" "Oh... but I'm not wearing any." His short stature was incomparable to his huge presence and overflowing confidence. That was who Nishinoya Yuu was, and you wouldn't change a thing about him. As his significant other and someone taller than him, you often heard whispers of gossipers, commenting about your height difference. You hated the idle gossip, though you eventually learnt to ignore it. Haters will hate, and you didn't need to let outsiders affect your relationship. Though you couldn't deny that it was difficult to bear the weight of their comments towards the start of your relationship. Nishinoya would laugh it off, telling you to ignore them. But you could tell that he too, was affected by it. Nishinoya had always been insecure about his height. He tried to hide it, but it was obvious that it hurt his ego knowing that he was shorter than most; shorter than you. They say that love overcomes all obstacles. You flopped onto the bed in exhaustion. The pillow caught your tired curses and muffled your voice into indecipherability. A loud thud sounded when his opponent fell. That distinct clatter of metal against the ground seemed to echo in the arena. There was a moment of utter silence that followed. The fallen knight struggled to get up, visibly trembling as he willed his body to move. But alas, the last of his strength slipped away and he caved, collapsing onto the ground once more in a slump. Applauses started to erupt from the audience, like a tidal wave, spreading from one side of the area to another. The people cheered loudly, their voices joining as one in a deafening roar. They finally had a winner. “Oh? Is that all?” You asked boldly. “That sounds like a problem,” you quipped. “It is,” he nodded, sarcasm lacing his voice. He was drawn to her in a way that he couldn’t truly comprehend. She was beautiful, but not conventional so. She was beautiful, deep down to her soul; and along with everybody else, Jean was captivated by the way she so fiercely embraced her life, despite the uncertainty of what the future would bring. She wasn’t perfect. That much he could vouch for, considering how he could easily list all her flaws off the top of his mind. But yet, he was completely vulnerable when it came to her. The moment he realised that he had fallen for her; it was a sudden epiphany that made him feel like the universe had come to a halt and the only thing he could process was the rapid pounding of his heart in his chest. The stars were shining down upon him as he stared into the expanse of the night sky, and as he thought of her again, he couldn’t help but let a small smile grace his features. You held back a laugh as you stared at your phone. The smile that adorned your visage couldn’t be concealed though. No matter how much you tried to mask it beneath a serious façade, the videos that played on the screen made you grin, filling you with mirth as you watched several kittens fumble across the display. A particularly funny video started playing, and you almost giggled aloud. Relieved you didn’t give yourself away; you leaned back into your seat, glancing up at your teacher to make sure that she hadn’t notice that you were not paying attention in class. The immaculately dressed teacher continued writing on the board, and your eyes focused once again on your phone; back to the adorable animals in awkward situations. She walked out of the lecture hall alone. With her books in hand, she let out a quiet sigh and stepped out into the open, glancing around the grounds of the university. A quick glance of her timetable told her that she had some time before the next lesson and thus she started making her way to one of the quieter cafés on campus. It was a café that he liked as well. They often frequented this place between classes, and sitting there with a coffee and book in hand really brought back memories of all those times they spent together. Coming to terms with his disappearance was difficult. His absence created a huge chasm in her everyday life. The best friend that she had was suddenly gone without a trace and even Hide had no idea where he was. Worst of all, his absence made her realize one thing. icyfalls has started a donation pool! firstly, i'd like to apologise for the long delay. life took an unexpected turn and kept me a lot busier than i'd like to be for the past few weeks. please forgive me! secondly, a huge thank you to everyone who participated and contributed! i was worried the contest would flop but ultimately received a lot more support than expected. all your entries were amazing and i had a really hard time while judging and picking out the best entries. When you kissed me, your body brightened but, whenever you’re with him, it’s your eyes that sparkle. i cannot begin to describe how much i love this. you have such a way with words and your stories really leave your readers craving for more. perhaps it's because of the narrative you've chosen, but this fic portrays a strong 'storytelling' vibe that i immensely enjoyed. the first sentence already had me hooked, and the last two lines (though it seems a bit jumbled) left a strong impact. there was good pacing and progression, in addition to an unconventional yet smart application of the theme. i was completely immersed in the fic and it left me with this twisted sort of self-satisfaction you get when reading a good angsty fic. You did an amazing job with this fic! Congratulations! soulmate au in which you can meet your soulmates in your dreams. Light footsteps. All you are aware of is light footsteps and silent ripples, as the small figure from far in the shadows sways slightly to the question you voiced. There’s a girl at the far end of this… dimension? This dimension you’re in. It’s all just darkness and water and little, little dim light. You squint your eyes as your feet take you across a vast expanse of water and hollowness, tiny waves rippling to each small step you take. You really don’t mean to be hurry, but you’re surprised to find your thirteen-year-old self cutting the breadth no matter how wide. to be completely honest, I was very hesitant about giving approval for this fic, but i'm sooooo glad that i did. i really can't stress this enough! the first thought that went through my mind after reading your fic was, 'thank god i said okay'. though i'm not the biggest fan of yachi or long oneshots, you really overcame all my biases with this wonderfully written story! there was good pacing, with every sentence contributing to the buildup of the plot. i'm so glad the fic ended the way it did! i'm such a sucker for happy endings and yours made me smile and gave me such happy feels! that being said, i especially loved how the reader grew to overcome adversity and be at peace with herself. its very clear from the intricacies that you spent a good amount of time planning and writing this story. you did an amazing job and congrats!! This story features a combination of a Guardian Angel!AU and a Soulmate!AU where the initials of your soulmate are written on your wrist. Trigger warning: major character death, reader discretion advised. They say that the strongest bond you can aspire in this universe is with a soulmate who also happens to be your guardian angel. Just like soulmates aren’t necessarily lovers, guardian angels may not be in love with you, let alone blood-related to you. A soulmate can be your best friend, your brother or sister, the love of your life, a parent, a relative or any stranger who leaves an irreplaceable mark in your life and turns into someone who’s not a stranger anymore. this is really such a wonderfully written fic! I find the concept of being a guardian angel on top of a soulmate very interesting and would have liked to see more of the guardian angel aspect of the bond. Your descriptions have me swooning and I love how weaved some semblance of reality into the story. 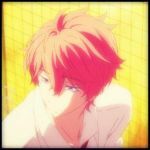 I also enjoyed your take on Kisumi's personality! The last part totally wrenched my heart out and I'm left sitting here, marvelling at your writing! Warning: a little bit of implied "stuff"
Hands intertwined, skin brushing against skin, the Blue Dragon worshiped the woman beneath him, memorizing the feel of her against his lips for the lives ahead. "I love you, (y/n)." It was whispered against her skin, a ripple in the warm silence enclosing them. "And I love you, Abi." The words came out on a breath, her eyes unafraid to meet his and show him the endless love contained within them. "I'll love you in all the lives to come." He smiled and nuzzled into the hand that had raised to cup his cheek, a fateful red string tied around one of her fingers, connecting her soul to his. "And I you..."
this has become one of my favourite akatsuki no yona fics! personally, i find it difficult to write shin-ah fics, so i admire how you managed to capture his personality so well. i also really like your writing style! it's simple yet descriptive, and that's one of the things which makes your stories so enjoyable to read. it's sweet to see how the characters overcame their hesitance having reunited. i'm really glad it ended the way it did, and this is a fic i will definitely be coming back to! great job on this! Her Knight and Day (IwaizumiXReader) SoulmateAU! Soulmate AU where people are born with flowers buds tattooed over their hearts. When they meet their soulmate, the flower blooms. WARNING: STRONG LANGUAGE, THE BEGINNING MAY BE DISTURBING FOR SOME AND POTENTIALLY TRIGGERING. IF YOU ARE UNCOMFORTABLE YOU CAN SKIP TO THE BOLDED TEXT. Overly graphic depictions are absent, but please read with your mental health in mind. The night was anxiety-inducing. Darkness suffocated the sleepy streets she scampered across to get home. Cool winds nipped at her legs and toyed with the ends of her hair. Her shaky breath brushed her lips as it mixed with the inky night. She constantly glanced behind her, peering over her bag strap with (E/C) irises. It was paranoia. But paranoia is only such if it isn’t justified. the concept of this fic is genius! the soulmate au you used was very interesting and you managed to put in an extra twist to the story that made it even more impressive! i love how their blooms are reflective of their personalities as well. your writing paints out each and every scene for your readers very clearly. i could almost see the entire story playing out in my head! speaking of painting... your art is amazing as well!!! all the effort you put into this entry really paid off because the outcome is really, really good! again, thank you to everyone who participated in the contest. you all did a fantastic job! please feel free to check out the other entries here and give all the participants the support they deserve! thank you for visiting my page!! please reply here if you wish to comment! have a lovely day, and always remember to smile! !